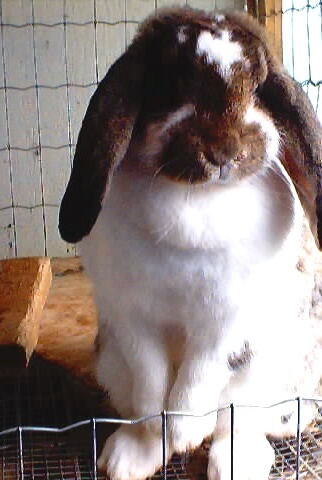 I currently have 4+ French Lop doe's and 17 babies in the nestboxes(or almost weaned) Also have 4 older bucks for sale! These animals come from quality breeders and hopefully should produce better than themselves. Will give discounts on trio's! Opal buck named Owen with 2 GC legs and his opal daughter??? (not sure on her!). This is Hazel she is a tad long in the shoulder but has an incredible head, HQ, and width to her body. Also has great depth and is a sweetheart. 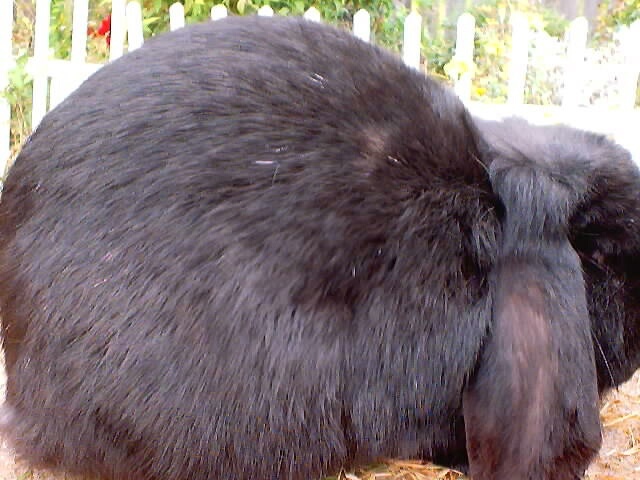 She came from Tiar black of Washington who has some very nice French Lops. Hazel's head is massive! Her 1/2 sister Queenie (who now lives with Sarah Young) also has a massive head. Macie is my new solid black doe. She is out of Linda Murphy, and Mary Whitney lines as well. She is a typey, sweet faced doe, who is a smaller doe but she goes back to large rabbits that are related to Hazel. She has had 10 kits from Buddy(Sarah Young's buck) with only 1 alive.